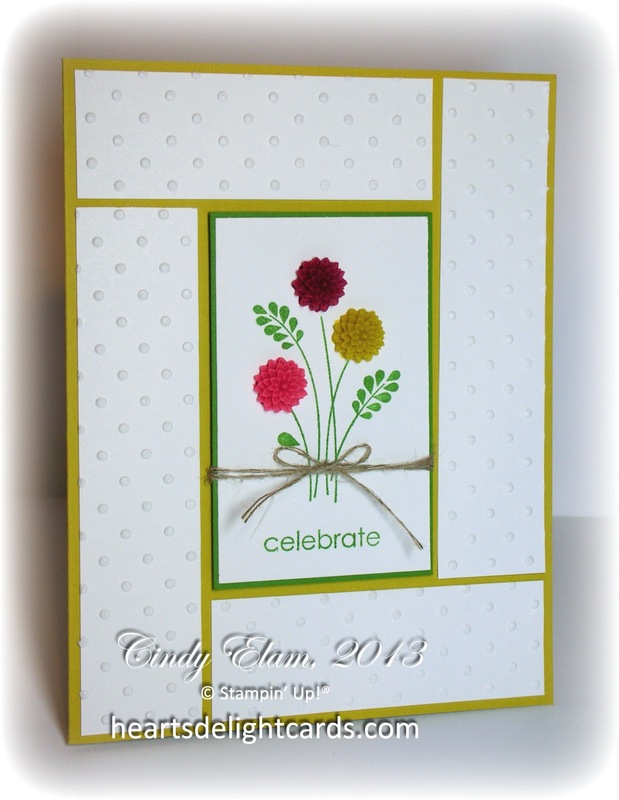 Heart's Delight Cards: SUOC67, Spring is in the Air! The challenge this week at SUO Challenges is "Spring is in the Air". No, really - Spring is going to make a comeback....I promise! I know those of you who are digging out of yet another snow storm find it hard to believe, but I've seen pictures posted of crocuses (croci?) peeking through the snow, so it will happen. Soon. Really. Trust me. Since Spring always brings new flowers, and I tried to make a CAS card, I settled on the little flower bouquet in Embellished Events. And I FINALLY used the In Color Dahlias that I've been hoarding since they came out last year. They are just so stinkin' cute! I also used the Summer Starfruit for the card base. I'm still really, really trying to like this color, and I'm still really, really struggling with it. *sigh* The embossed panels did tone it down a bit. So, pull out your favorite stamp set that makes you think of Spring, and the Springiest colors you can think of, and come join us at SUO Challenges! P.S. If you are into making ATCs (Artist Trading Cards), this stamp would work perfectly. P.P.S. Sorry (again) for the less-than-stellar photo. I have a new camera coming Friday (woohoo! ), so that problem should be remedied VERY soon!!! Well even if Starfruit isn't your fav. colour you managed to show off nicely. I love how you used the Dahlias! Thanks, Jutta! I've tried to like it....really I have! Your card is so pretty and looks like spring. It has to come soon...I hope! The green actually looks great especially with the white front. 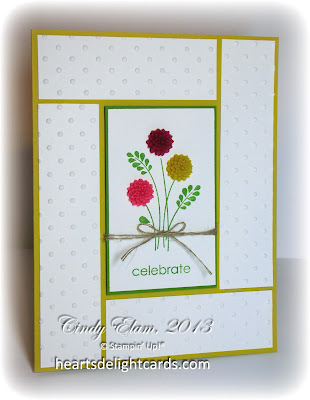 Would you mind sharing the dimensions for the center piece and white embossed strips?